Growth Habit: Upright, multi-stemmed, large shrub. Type of Plant: This weed is a handsome, variable, deciduous shrub that can grow up to 2m in height. Flowers: Very showy purple flowers are produced and hang in clusters. Fruit/Seed: Numerous black berries are formed in summer. Dispersal: Birds readily eat the berries and later pass the seed unharmed. 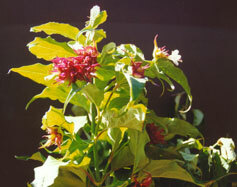 Distribution: A relatively common garden plant now widely found in damp bushland areas throughout Tasmania. Elisha’s tears is a serious bushland invader and is capable of forming strong colonies in wet bushland areas. Once established, it excludes native flora and fauna. Grubbing (all year). Remove seedlings and small bushes. Herbicide (summer, spring and autumn). For larger plants, spraying and the cut stump method work. Herbicides registered in Tasmania include glyphosate and triclopyr.